We focus on establishing and sustaining a successful Breakthrough Innovation capability in your company. While several of us are recognized technical experts in a particular domain, we do not engage as such but instead as technical experts who possess deep understanding, skill, and experience as to how best to enable your company’s experts to succeed to the benefit of all. Engagements come from various parts of our clients’ organizations, including owners, CEOs, CTOs, technical managers, and the Serial Innovators themselves. We serve variously, as detailed below, from senior executive advising and consulting engagements, to Serial Innovator and Serial Innovator Manager training and coaching engagements, to assuming responsibility to implement some or all of a Breakthrough Innovation capability. 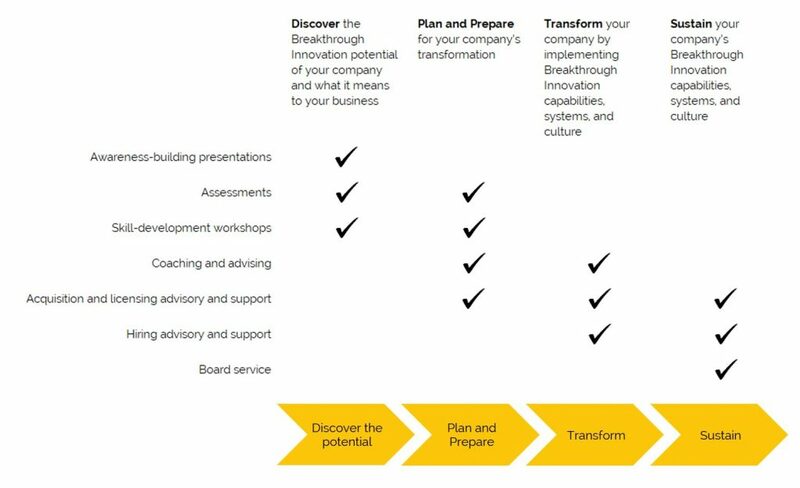 Breakthrough Innovation Advisors can help you Discover the potential of, Plan and Prepare for, Transform in order to realize, and Sustain the benefits of Breakthrough Innovation. To meet client needs, before the engagement Bruce works with them to understand their goals for the event, what they hope to accomplish through his presentation, and the composition of the audience, as well as to identify any concepts or terminology that might require clarification for the audience. As appropriate, Bruce will modify his presentation to make the most effective use of the client’s time during his visit, while remaining true to original material. Additional richness and insight can be brought to these speaking engagements by including other presenters from the network of associated advisors and organizations. Depending on client needs, emphasis can be added in any of a number of areas, including aspects of organizational behavior, empathic design, innovation management, and the contrast between incremental and Breakthrough Innovation. And nothing brings these insights to life more powerfully than a proven Breakthrough Innovator sharing their personal experiences and insights. Associated services that may be incorporated as part of a speaking engagement include, but need not be limited to individual and / or group meetings with: senior executives, senior technical staff, technical management, human resource management, and / or cross-functional teams. The insight, implementation, leadership and culture necessary for Breakthrough Innovation success flourish in an environment in which strategy, organization, processes, practices, and policies all work together as a system to that end. When executive leadership is concerned about the overall functioning of their Breakthrough Innovation capability, a broader engagement – an engagement where the Breakthrough Innovation capability itself is renewed – is recommended. Breakthrough Innovation Renewal goes beyond individual Assessments and Recommendations and is designed to comprehensively help companies ensure that they possess the business strategy, organization, processes, practices, and policies, as well as the people, necessary for long-term business success. Based both on extensive industry experience and on the findings of academic research across dozens of companies and industries, the assessment, planning and execution phases address the most critical needs necessary to renew an innovation-friendly culture in your company. Having raised awareness with presentations, Breakthrough Innovation workshops enable all levels of employees to both further understand and practice the kinds of insight, implementation, leadership and culture necessary for long-term business success. And, just as with the Awareness-building speaking engagements, considerable richness and insight can be added to the workshops by including other presenters from the network of associated advisors and organizations. Company-custom workshops are an attractive option for clients seeking to roll-out these concepts on a broad basis across their company. Customization can include, but is not limited to: (1) changing the balance and emphasis of existing materials (designed for more general audiences) to meet specific company needs, (2) developing and incorporating additional, related concepts to meet specific company needs, and / or (3) modifying existing materials (designed for more general audiences) to include company-specific illustrations led by company employees recognized as successful innovators and / or their managers. Further, Bruce and colleagues from his network, as appropriate, can work with clients to help them meet their goals by identifying and / or developing training programs that complement his existing material. Coaching and advising engagements provide the flexibility to address specific client needs, ranging from one-time discussions, to address a specific issue, to ongoing interactions as a means of long-term development. Coaching engagements can make sense in a variety of formats, from working with individuals to pairs (especially Breakthrough Innovator – manager pairs) to teams. Bruce brings not only personal expertise and experience to such engagements, but also draws on the wealth of insight (shared anonymously and in aggregate so as to not violate confidentiality) developed through his research that covered many industries and often multiple companies within an industry. As with the other offerings, members of the network of associated advisors and organizations can be brought in to provide additional coverage related to their areas of expertise and experience. Bruce is a seasoned contributor to investment, acquisition and divestment projects. During a three-year corporate development assignment at Amoco Corporation he served variously, including performing financial valuation analyses, assuming responsibility for technical assessments, and participating in due diligence evaluations. Further, during the divestment of his subsidiary, he led the technical due diligence activity for the sale of his business unit on behalf of Motorola. Bruce also brings expertise and experience in technology protection and licensing, having served as co-chair of his business’ patent review committee throughout his nearly four years at Motorola, as chair of the campus’ technology transfer office Advisory board for over ten years, and as a member of the university system-wide intellectual property committee for one year. Coupled with his insight into Breakthrough Innovation, Bruce is available to add value to the investment, acquisition and divestment activities, as well as technology licensing activities, of companies, venture capital groups and investment banks. Individual, personal expertise is at the heart of our understanding of Breakthrough Innovation. As such, finding the right people for the right roles is one of the most critical activities in establishing a successful Breakthrough Innovation capability. From advising on recruiting and hiring practices to participating in candidate interviews, Bruce and several members of the network of associated advisors and organizations are highly qualified to assist clients in identifying potential Breakthrough Innovators and in evaluating those who present as proven Breakthrough Innovators. As an authority on Breakthrough Innovation who also possesses business experience and expertise, Bruce provides a complementary perspective on boards comprised of CEOs and other industry leaders with backgrounds in marketing, finance, accounting, operations, manufacturing, and engineering. Appropriately balancing his input with the company’s ongoing, near-term needs, Bruce provides a clear, yet reasonable voice for strategic Breakthrough Innovation, research and development, and engineering and design excellence. Bruce currently serves on the Board of Directors of Midtronics, Inc. (recognized in 2015 as Chicago’s most innovative company by Crain’s Chicago Business) and the Advisory Board of JVA Partners (a private equity firm).